Back in January, I shared a Disney-themed card I made to coordinate with the Mickey Mouse outfit Trevor picked out for his future baby cousin. I mentioned that I'd be making a creative gift to give after the baby was born. I'm thrilled to announce that the baby is here - my first niece! She's absolutely beautiful and such a joy. Here's Trevor holding Allison Kate, who is about 6 hours old in this picture. Well, not quite. This one has Trevor's handprint and I am keeping it. (Fortunately, my sister thought nothing of me handing her a gift, watching her unwrap it, then taking it back from her.) The one I make for my sister will have her two children's handprints on it - 12 year old Timothy and newborn Allison. To make one, you need: a canvas, gesso, foam brush, acrylic paint (brown, white, black, yellow, green), pencil, baby wipes. Begin by priming the canvas with gesso. After that is dry, add a blue sky. I started by putting white paint on the canvas and adding streaks of blue over that until I had the look I wanted. Let it dry thoroughly. Use the foam brush to cover the child's hand with brown paint. Make sure the hand is completely covered and that the paint is even. Stamp the hand firmly on the canvas. Lift straight up when removing the hand. Use baby wipes or warm soapy water to clean the child's hand. Let the handprint dry. Paint a tree branch horizontally across the canvas so that the palm of the hand is above it and the fingers extend below. Add the trunk of the tree off to one side. Use the pencil to lightly draw circles where the eyes will be, then fill in completely with white paint. This will take two or more coats to get good coverage. Let everything dry. Use the yellow paint to make talons. Add a yellow triangle beak. Paint pupils in black. Finish by painting green leaves on the branch. Easy as pie! At least, it is with a cooperative 6 year old. It might be a totally different story when I go to make this with a newborn's curling little hand. Anyone have any tips?! About a month ago, I completed my 35th goal, Library Roulette. I enjoyed the project so much that I decided to declare Goal 35.5 to be Library Roulette - Junior Edition. The plan was to pick a book from each of the 10 Dewey Decimals numbers of the original challenge, all from the Young Adult / Children's section. As it turns out, the children's non-fiction section is not as extensive as adult non-fiction, at least not in our county. After visits to three different library branches, I've found children's books from 8 of the 10 Dewey numbers in my original challenge. I was not able to find any children's non-fiction in 003 (Systems) or 021 (Library Relationships). Here's the stack of 8 books that will make up my Library Roulette Jr. project. It's about 1/5 the height of my original Library Roulette stack! So, with no further ado, here is Part One of Library Roulette - Junior Edition. I knew almost nothing about Area 51 before reading this book. 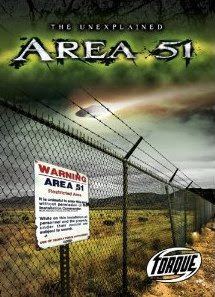 After reading this book (which has only 11 pages of text), I still don't know all that much about Area 51. Obviously, I can't expect children's books to go in-depth on a subject, but I was hoping for a little more. Of course, since the title starts with "The Unexplained," I suppose there is only so much a non-fiction book can cover! I find it somewhat ironic that this is what is categorized in the "Knowledge" section. The inside cover says this is geared toward 3rd - 7th grade students. I agree that it would be suitable for 3rd or 4th grade, maybe 5th, but it seems far too simplistic for middle school. There were quite a few books to choose from in the Library Operations category. Many were extremely introductory books about libraries ('Meet a Librarian' preschool type of books), so I checked the Young Adult books. This one called out to me, being that I'm a smart girl and all. I absolutely loved this book. It was well-written, practical, and perfectly targeted toward preteen girls who may be interested in email, chat rooms, instant messaging, downloading music, and social networks. Even though I read it about 30 years too late for me to benefit, it was still interesting and informative, and gave me a better idea of what children growing up in the Internet age face. My ONLY complaint about this book is that it is so blatantly only for girls. There is no reason it couldn't have been a smart KID'S guide instead of just a smart GIRL's guide. But every page references girls and addresses the reader as a girl. As the mother of a son who is just starting to use the Internet, I would love to have a corresponding book for him, but there isn't one. Recommended: Yes, highly... for both preteen girls and their parents. You know what they say: Don't judge a book by its cover. Based on this cover, I wasn't terribly interested in starting this book, but once I did, I couldn't put it down. The book starts with the Pharisee Saul (as Paul was known), witnessing the trial and execution of Stephen. 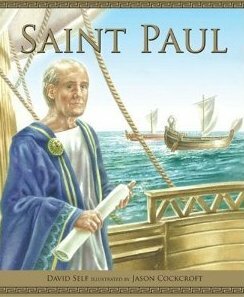 It describes his conversion (and name change), his travels, and his many adventures. It has 37 pages of text and is best suited toward upper elementary age students. An interesting tidbit: this book is dedicated to its own author. David Self died after finishing the book, but before it was published. I'm sure that must happen occasionally, but I've never seen it mentioned in the dedication. I'll share the next books in a future post. 1. Heidi Swapp patterned paper - "Vintage Chic"
3. Glitz Design stamps - "Vintage Blue"
As usual, I was stumped when I first saw the 4 items. The paper would be easy, as would the stamps. The domino would be tougher, as it violates my "no lumps on layouts" policy. The stick pins were lumpy too. 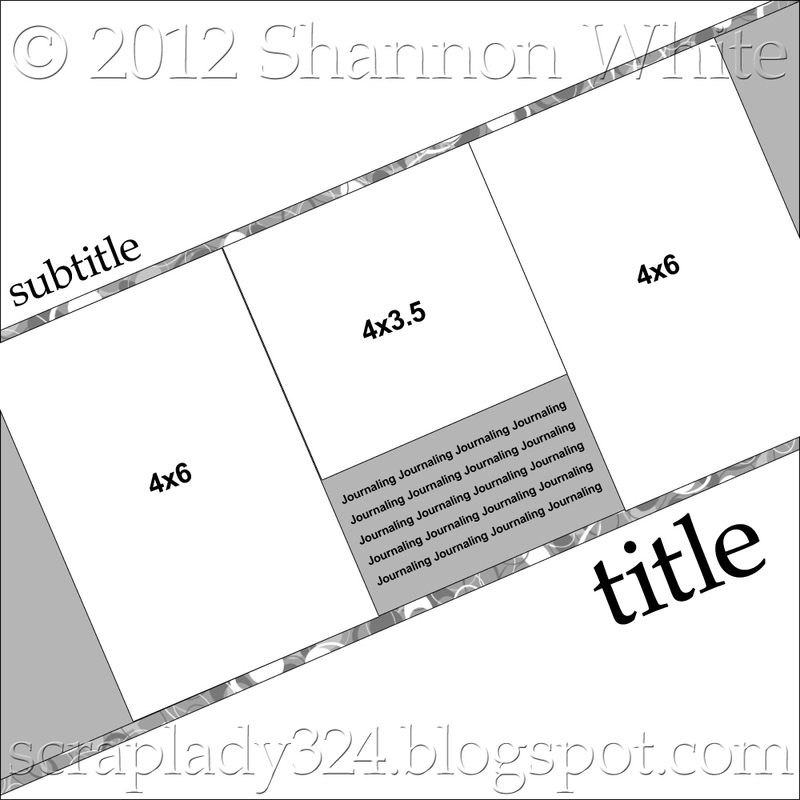 So a layout was out. I wasn't especially inspired by the 5 of the domino (we're a family of 3, Trevor is 6, married 8 years... no 5's come to mind), but the smooth and empty back seemed like the perfect place for a sentiment. Would a rub-on stick to a domino? I was nervous to try, as I only had the one domino. And I hadn't decided what my final project would be, so I couldn't select a sentiment yet. Maybe the stick pin would provide inspiration. As I was playing around with it, I noticed that the decorative head nestled nicely with the domino. Hmm... could I remove the flower part from the pin part? Yes! Piece of cake. At this point, I knew exactly what I was going to do. 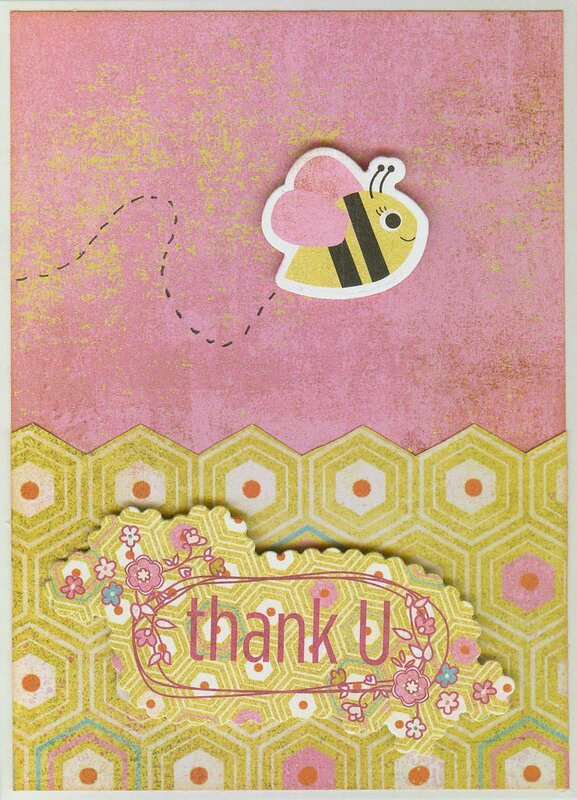 To see what the other three designers made, head over to Flamingo Scraps. It's always so fun to see how four people can use four products in such different ways. On top of my small bookcase, I store printed photos and memorabilia waiting to be scrapped. I used to be really good about filing it all in that photo box you see, but nowadays I'm far more likely to just pile it somewhere... including on top of the photo box. These are Trevor's school pictures and class picture that came home in the fall. They're still in their envelopes. I always buy the absolute cheapest package that includes the class photo, as that's all I care about. The portraits we take at home of Trevor are so much better than any school picture that I don't even give these out. But since I have no other way of getting portraits of all his classmates, I buy the cheap package. Last week, I posted about using a Baskin Robbins gift card holder on a layout and not caring that it might not have been acid-free because it wasn't touching my pictures. That must have been on my mind, because when I went in to my scraproom earlier today, I noticed these pictures for the first time in months. (Isn't it weird how you can pass by something several times a day and it's virtually invisible to you?) When I noticed them, I had a fleeting worry that the envelopes they're in might not be acid-free. While I don't care all that much if my embellishments on scrapped and scanned layouts are not archival, I do care about preserving the one and only copy of Trevor's class pictures. I grabbed my acid-tester pen and did a quick test. Blue is acid-free, green is medium acid, and yellow is high acid. Fortunately, the envelope tested blue. But what about the reorder form that's tucked inside the envelope, touching the entire class photo? Blue as well, thank goodness. Moving the school pictures off the pile revealed an envelope of to-be-scrapped pictures from Costco. Acid-free? Nope. I watched as the ink dried from blue to a light greenish yellow. Wow. I don't tend to store pictures in Costco envelopes long-term. 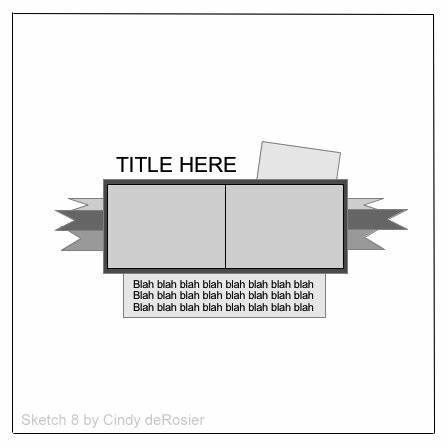 Instead, I use Shutterfly envelopes, all neatly labeled by topic. Since they're more expensive than Costco and do nothing but pictures, surely their envelopes are acid-free, right? No. In case it's hard to see in this picture, the line on this Shutterfly envelope is yellow. It's more yellow than the Costco envelope. I will be moving my pictures out of these envelopes and into something else as soon as I can figure out what that something else will be. I'd like them to fit into the photo organizer I already have. Any recommendations? I've mentioned before that I'm not the trendiest scrapper. (With the exception of this awesomely, fantastically trendy project, of course.) In fact, I'm probably one of the least-trendy scrappers around. When I do embrace a trend, it's usually only after I've given it time to grow on me. But most of the trends pass right on by me. I haven't accented with mason jars or used feathers on a layout. I don't have a single project that's mint and orange. I haven't used any Polaroid-shaped chipboard, nor have I used mustache patterned paper. And up until a few days ago, I hadn't used hexagons. No particular reason why, as I have nothing against hexagons. Each Wednesday, Ideas for Scrapbookers (where I am a Contributing Artist) has a Designer Showcase, featuring a particular topic, design element, or theme. Today's is hexagons. We get the list of topics several weeks ahead of time so that we can create something to fit the theme if we don't already have a relevant project to share. I dug through my stack of patterned paper and discovered that I do actually own quite a bit of paper with hexagons. So I made a card. As it turns out, I really like working with hexagons! I can definitely see using them again for future projects. What about you? Thumbs up or thumbs down to hexagons? I think I have a new favorite layout. I absolutely love how this one came out. The background paper is from BasicGrey's Wander collection and has airplanes on it. I wouldn't normally use travel-themed paper on a non-vacation layout, but I liked the way this looked. Plus I liked the subtle symbolism: through books, you can go anywhere. 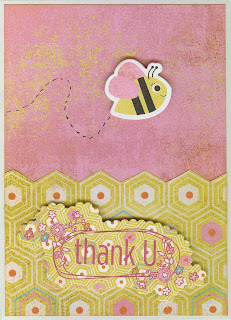 All the strips and the journaling block were scraps from three very different BasicGrey collections: Kioshi (pastel floral/Asian themed), Oh Baby Boy! (pastel baby-themed), and Lemonade (bright summer-themed). I think they work together well. I think I'm going to make a sketch based on this layout. I can definitely see myself using it again and again. I've been wanting to do a color wheel project with Trevor for awhile now, and having a playdate provided the perfect opportunity. I gave Trevor and his friend three Nilla Wafers and had them frost the flat side of each with one of the three primary colors. I asked what would happen if we mixed equal parts of blue with yellow, red with yellow, and blue with red. They knew that the primaries would mix to make orange, green and purple. They did the mixing and frosted three more cookies with the new shades. I told them these were called secondary colors. I gave them each 6 more cookies to arrange between each primary and secondary color. I asked what would happen if we mixed a primary with a secondary. Trevor guessed that we'd get an "ish" color, like "greenish-yellowish." Good answer! I reminded them of the terms primary (meaning first) and secondary (meaning second) and asked what they thought this group of colors might be called. Trevor guessed "thirdary." A good guess, and fairly close to the correct answer, tertiary. They mixed up the colors. Here they are with their completed color wheels. And now, the best part... eating them! For the record, I usually serve fruit and/or crackers when a friend comes for an after-school playdate. This is the first time I've ever served 12 frosted cookies as a snack! But it's justified in the name of education and experimentation, right? We are fortunate to live just a few minutes from the Jelly Belly Factory. It is an awesome place. When Trevor and I were there in late January to get Steve jelly bellies for his birthday, we noticed their adorable peas and carrots candy. It's basically the same stuff as candy corn. The peas are flavored like green apple and the carrots are orange sherbet. It got me thinking.... bunny Valentines! To make the bunnies, you need grey paper, pink paper, circle punch, scissors, mini heart punch, glue, and a black pen. I helped Trevor punch out 30 circles, then we cut 30 pairs of ears. As he arranged ears, I punched out 30 pink heart noses. Trevor drew 30 faces, then glued on the ears and noses. Here's a close-up of a bunny. So cute. I cut white cardstock to size, then Trevor stamped "From" and signed his name on each one. We filled bags with candy, stapled a card to each, and glued a bunny to cover the staple. I should mention: there are 29 kids in Trevor's class. He liked these Valentines so much that he insisted on making one to give to himself. Trevor is very interested in birds. He loves building and decorating birdhouses and is always asking if we can make birdfeeders. Every once in a while, we make edible ornaments or pinecone feeders for the birds. It's so much fun to watch the birds enjoy the treats. My mom is an avid birdwatcher and subscribes to Birds & Bloom magazine. After she's finished with them, she passes her issues along to us. As I was flipping through the December/January 2013 issue, I found a no-bake recipe by Susan Ebnit that I knew Trevor would love to make. By using Valentines cupcake liners, the finished Bird Cupcakes were a perfect seasonal gift for his feathered friends. We made some tweaks to Susan's recipe. Here's our version. Add shortening and peanut butter to a medium bowl. Heat in microwave for 20 seconds or until soft. Stir in cornmeal and most of the sunflower seeds. Insert 6 cupcake liners into pan, then pack mixture evenly into liners. Use the remaining sunflower seeds and craisins to decorate the tops of the cupcakes. Put the completed cupcakes into the refrigerator for at least 30 minutes. We weren't sure what birds would eat these or what the best locations would be, so we spread them in different places around the yard. This one is on our back fence. Here's one in the orange tree. Another went into our plum tree. What a fun way to say Happy Valentine's Day to the birds!